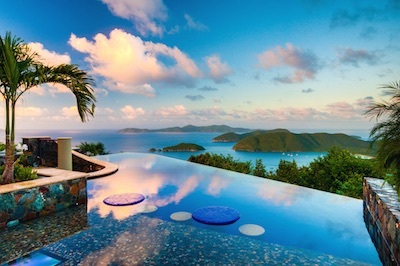 WHY CHOOSE our St John Villa Rentals? 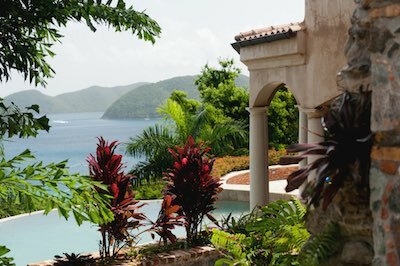 A St John Villa Rental in Peter Bay at St John’s National Park located between Trunk Bay Beach and Cinnamon Bay Beach. Luxury within walking distance to Peter Bay Beach! An Old World St John Villa Rental close to the beaches of St John Peter Bay, Trunk, Cinnamon, Maho, Francis Bay, Hawksnest and more! My favorite time is sitting at Amorosa's waterfall Pool bar and watching outdoor TV and drinking rum punches. A stone staircase wraps the bar and the waterfall leads to an upper terrace. A Luxurious, Spectacular St John Villa. After you hit the close by beaches - trunk Bay beach and Cinamon Bay Beach, then stroll back to Amorosa to grill steaks and swordfish St John Poolside, with an island cocktail, you'll never be the same. Amorosa, Perfect Luxury in Paradise! 4 ½ bdrms. For an Economy St John House Rental, choose This walk to the beach St John Villa 20’ from one of the most spectacular tropical reefs in the world. This Affordable Vacation Villa Rental has all you need for a great time on St John. The kind of vacation property that my wife and I searched for when we first went to St John in the early 90’s. We wanted one of the best locations so we could get to town and shopping and dining but real close to our favorite haunts like the Beach Bar and Woody’s. Among the most economical St John Villa House Rentals. Thrilling, fun filled water adventures - a few steps from the door. Imagine grabbing our free snorkels and kayaks right at your door and swimming on St Johns most remarkable tropical reefs. 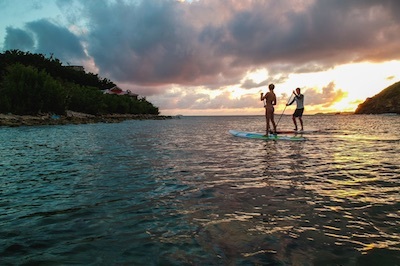 We paddle all around Chocolate Hole Bay and usually end up walking to Chocolate Hole Beach. Spend a fraction of what most St John Villa Rentals on the beach charge and be every bit as comfortable. Beach Walk is more economy minded than other St John Villas. It has every amenity you need for great economical fun and adventure. A Resort across from the Westin Hotel & watersports. 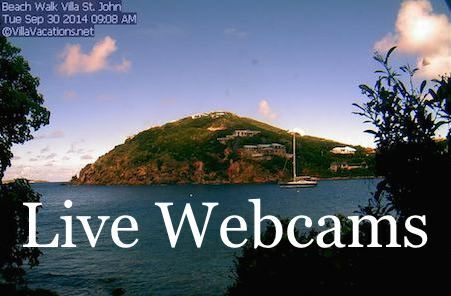 Close to scuba diving, day sails, and trips to the BVI. Located in Saint Johns Virgin Grand Estates. ​ A Resort with The Best Sunset on Earth! The round kitchen may be the most famous on St John, and features all the best in Resort Appliances. Carefully laid with handmade antique brick, no other resort on St John can match this comfort, luxury, and privacy. Take walks along the gated villa road to the Westin Hotel Resort and Beach. Go to the beach bar for lunch, then enjoy scuba diving or boat rental. Grab a day membership at the Westin Hotel Resort Gym, then come back to your own Private Resort for a pain killer cocktail. 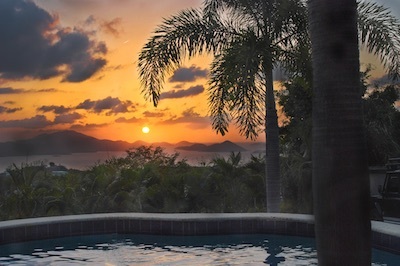 Kick back for the best sunset on St John Island. Catherineberg, Cinnamon Bay Beach in the USVI National Park. A Saint John Cinamon Bay Trunk Bay Beach Rental, in Catherineberg. Beaches galore! Cinnamon Bay, Trunk Bay, Maho, Hawksnest and Francis beaches! Old St John is still found in one place, Catherineberg. Trunk Bay Beach, & Cinamon Bay Beach are convenient to Island Stones. Shop at Mongoose Junction, pick up supplies at Starfish Market, dine at the many fine restaurants, or walk the streets and enjoy the quaint Catherineberg shops. Walk to Cinamon Bay or Trunk Bay Beaches, Foxy’s and Soggy Dollar Bar. One of my favorite excursions, is to take the ferry over to Jost Van Dyke for the day- remember to bring your passport. Back in time for Cocktails and BBQ at the Catherineberg Island Stones pool deck bar and grill. This villa is simply the best! Our family has stayed here before and we come back each time for the beautiful views, convenient location and incredible amenities. We were able to walk to Trunk Bay with no problem and drive into town many nights to enjoy the nightlife. But the best part was just spending time there, enjoying the pool and outside barbecue and spending time with family and making new memories.